Fifty years ago, three marches from Montgomery to Selma, Alabama contributed to the passage of the 1965 Voting Rights Act. The first march took place on March 7, 1965 and became known as Bloody Sunday. An estimated 525 to 600 civil rights marchers headed east out of Selma on U.S. Highway 80, going according to plan until the marchers crossed the Edmund Pettus Bridge, where they were attacked by local and state troopers with tear gas and billy clubs. The second march took place on March 9, 1965 and became known as Turnaround Tuesday. Dr. King led about 2,500 marchers out to the Edmund Pettus Bridge and held a short prayer session before turning the marchers back around, thereby obeying the court order preventing them from marching all the way to Montgomery. The third march started March 21 and the marchers averaged 10 miles a day along U.S. Route 80, known in Alabama as the "Jefferson Davis Highway". The marchers arrived in Montgomery on March 24 and at the Alabama State Capitol on March 25. On Sunday, March 8, 2015, I joined 70,000-100,000 marchers in downtown Selma, AL to cross the Edmund Pettus Bridge in a re-enactment of the 50th Anniversary of the Voting Rights Campaign. This respectful group, walking much of the time shoulder-to-shoulder, shared a goal of “crossing the bridge” to honor those who crossed the Edmund Pettus Bridge 50 years earlier. It was an emotional experience for me as it appeared to be for many of the marchers. This march re-enactment was the fourth and final day of my participation of the “Marching in the Arc of Justice: A Conference Honoring the 50th Anniversary of the Selma Voting Rights Campaign (March 5-8, 2015). My attendance at this conference was activated after reading Mark Morrison-Reed’s article “Selma’s Challenge” (UU World, 28(4), 33-37)(Winter 2014). After reading this article knew I had a lot more to learn about the history of voter rights in our country as well as the 50+ year history of involvement by the Unitarian Universalist Association. This conference was a partnership between the Living Legacy Project, the Unitarian Universalist Church of Birmingham, the Unitarian Universalist Association, the Unitarian Universalist Board of Trustees, the Fund for Unitarian Universalist Social Responsibility, the Unitarian Universalist College of Social Justice, Faithify.com, and Cline Tours. The conference included nearly 500 participants with two days of conference sessions in Birmingham and two days of experiences in Selma and Montgomery. The first day was a morning conference in Birmingham and afternoon trip to Selma. The second and third day involved conference session in Birmingham. 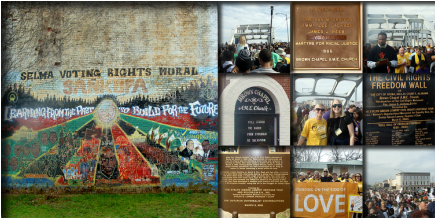 The fourth day was a trip that started off with a trip to Montgomery and City of St. Jude, followed by a return to Selma to re-enact crossing the Edmund Pettus Bridge. I want to share a few highlights with you from the four days that had and continue to have a powerful impact on me. lives. She reminded me that we all need to have equal voting rights. Reverend Jerimiah A. Wright spoke about the use of the language “black lives matter.” Yes, he agreed with these words, but directly and frankly he told us that it does not appear that “black lives matter” in our country because current laws and practices do not consistently reflect that black lives matter. Instead it appears that “black lives do not matter.” If all lives matter and in that, black lives matter, then our voting rights should reflect this equity. Last to speak in this evening mass meeting was Reverend Dr. William Barber II, the current President of North Carolina NAACP. Filled with emotion, he told us to remember the blood shed 50 years ago on Bloody Sunday and he passionately spoke about the power in the blood that was shed. We can’t forget this; we have to continue to remember this history and that we must move forward. On Friday evening, March 6 the conference attendees honored the families of the martyrs: James Reeb, Viola Liuzzo, and Jimmie Lee Jackson. This was an emotional evening filled with loving memories. We heard words of strength, thanks, and wisdom from family members honoring the memory of each of these individuals who answered the call from Dr. King to come to Selma in 1965. They answered the call and in that, they gave their lives. On Saturday in one of the conference sessions highlighting the book “The New Jim Crow” a young African American woman from St. Paul, MN asked the group to give her a reason to have hope for the future. She reiterated to us that she was struggling having hope as a result of the racism she was facing and she told us about her best friend who was supposed to join her at this conference but was now in jail after being arrested at a Black Lives Matter event at the Mall of America. Crying, this young woman told us that inequities and racism are not just happening in the south. At this same session a Caucasian woman (appeared to be 10+ years older than myself) stood up and told us that she marched 50 years ago and that she never expected that hard, long fight would now be dismantled 50 years later. Almost in tears, she also asked the participants for a way to feel hopeful about the future. And third in the session (also brave and moving to me) was an middle-aged African American woman who eloquently said to the group “you whites have to start talking to other whites” followed by her explanation that she/we can’t do this alone. She reminded us that we need allies who will speak up and speak out for us and for justice. On Sunday we returned to Selma to cross the bridge. Our bus route took us first to Montgomery and to the City of St. Jude where were enjoyed a delightful lunch and participated in a worship service with abundant singing. The City of St. Jude was the 4th campsite for marchers on their way to completion of the third march in 1965. After filled stomachs and hearts, we boarded our busses for Selma to march across the bridge. All nine buses returned to the hotel and conference center in Birmingham by 7:00 p.m. where the conference concluded with a shared meal and expressed thanks to our leadership planning committee. The conference in my view ended much the same way it started and consistent with the covenant that I share below. The last person we honored was the owner of Cline Tours, who was given a plague and generous words of appreciation. When this gentleman came up to speak to us, he opened by admitting that he was not share the same spiritual background as us (UUA), but what was clear to him is that this did not matter. He has been the main provider of transportation for the UUA’s work in the area for many years. He told a story of how the members of the UUA in Birmingham reached out to him and his wife a few years ago when they lost a daughter and how sincerely kind members of the UUA have always been to his family as well as how good to work with. He shared that despite the different faith perspectives, he considered UUA part of his family and he supported the work we were doing and hoped we would continue. Open heart, ears, and mind; I tried my best over the course of the four days to do this. The conference leadership planning committee facilitated this for me and for all conference participants. On Thursday morning during the first 30 minutes of welcome and orientation, the planning committee representatives presented a covenant to all of us. We were asked to read the covenant aloud together and make a commitment to follow over the next four days. We were reminded of the covenant at the start of each bus trip and the covenant was on the back of a map of downtown Selma (so we could take the covenant with us during the march). The practice of covenant is consistent with the foundation of UUA practices and how we are going to treat one another. The following was our covenant, our grounding foundation for behavior March 5-8. Assume positive intent on the part of fellow participants. Use “I” statements when sharing experiences, feelings, and opinions. Do not ask others to speak as “experts” on their particular culture, race, or ethnicity. Set your own boundaries for personal sharing. Speak personal “truths” in constructive and civil ways. Speak personal concerns directly with that person, not about them. Recognize that building community is difficult; take risks. Respect and validate other people’s experiences. Share your personal stories and learning with others; respect those of others. Challenge yourself to hear, see and experience old and new information with an open heart with eyes and ears focused on present and future. By this Covenant, we honor the spirit of Sankofa; looking back in order to look forward. Participating in the “Marching in the Arc of Justice: A Conference Honoring the 50th Anniversary of the Selma Voting Rights Campaign” provided me with the opportunity to educate myself on our nation’s history. As a result of this “look back” I am better equipped to open my heart, eyes, and mind to the future. So, now “What am I going to do? What are you going to do? What are we going to do? Covenant adapted from, “Building the Word We Dream About.” Unitarian Universalist Association, Tapestry of Faith, copyright 1995-2105. King, Martin Luther, Jr., Unitarian Univeralism, & Beacon Press (2014). Witness for the truth. Boston, MA: Beacon Press. King, Martin Luther, Jr. (1968). Where do we go from here: Chaos or community? Boston, MA: Beacon Press. Morrison-Reed, M. (2014, Winter). Selma’s challenge. UU World, 28(4), 33-37. Morrison-Reed, M. (2014). The Selma awakening: How the civil rights movement tested and changed Unitarian Univeralism. Boston, MA: Skinner House Books. Norsworthy, R., Olsen, C., Miller, O., Thurman, H., Sullivan, J., & McGinty, L. (1965). Selma: The witness. The Liberal Context, 14, 1-20. Presentations of Courageous Love Awards to the families of the Jimmie Lee Jackson, James Reeb, and Viola Liuzzo, martyrs of the Selma Voting Rights Campaign. Scroll down to view a gallery of photos from the event.